ATLAS (C1) FRACTURE "Jefferson Fracture"
However, because the Jefferson fracture constitute the most frequent form of the Atlas fractures, and also they pose much more clinical problem than those of the single lateral mass or lamina fractures, the term of Jefferson fracture is frequently used for all Atlas fractures. The same approach will be applied throughout the current text. Atlas fractures are rare. Fractures of the atlas compromise 25% of atlantoaxial complex bony injuries, 10% of cervical spine injuries, and only 2% of all spine injuries. In the pediatric population, C1 represents only 1-2% of spine trauma and 2-10% of all cervical injuries. However, the associated mortality is 16%. Diving in shallow water and motor vehicle accidents (being thrown up against the roof) are the major causes of the atlas fractures. Falling onto the head may cause the fracture, especially in toddlers, because of their disproportionate head size. Atlas fractures most commonly resulted from axial loading on the head through the occiput, leading to a burst-type fracture of C1. The mechanism may include hyperextension, lateral compression, and axial compression. The ring of C1 is a structural member of the cervical spine. A fracture of a closed ring necessarily results in multiple areas (at least 2) of ring disruption. These disruptions are generally accompanied by a spread of the C1 parts as a result of the axial loading mechanism of this injury, the weight of the head and and the muscular contraction acting through this articulation. Thus, occipital condylar support for the head is lost. The absence of the rigid bony structure and the lack of interconnection or interrelation of the attached ligamentous structures may cause spinal instability, particularly as the bony protective function of C1 for the neural elements is lost. 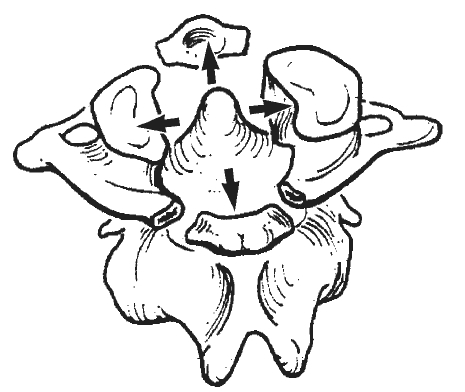 Less frequenty, when a significant rotatory force is exerted, an atlantooccipital junction dislocation may occur or the force may also be dissipated through the odontoid as an associated fracture. Vertebral artery injuries have been reported as a result of C1 fractures, especially with atlantooccipital dislocations. Patients generally present with a history of trauma and a symptom of pain in the neck. There is usually no cord compression and associated neurologic deficit, because the fracture widens the ring of C1, which at this level spinal canal is composed of one-third dens, cord, and space according to Steele’s rule. If the patient has neurological deficit, it may be very severe. Those patients may present with a complete spinal cord injury and no neurologic function below the level of C1 and no voluntary breathing. In that case, endotracheal intubation, then a tracheostomy is essential because the patient requires respiratory assistance. If the C3-C5 area is intact, phrenic nerve stimulation may be effective. In addition to anteroposterior and lateral views, radiographs of the upper cervical spine include the open mouth view. The open mouth view may identify a spreading or widening of the lateral masses or an asymmetry of the separation of the odontoid from the lateral masses, which, in an appropriately centered radiograph, may be consistent with spreading of the C1 ring or a C1 fracture (see the figure above). When examining AP or open mouth odontoid plain films, the rule of Spence can be applied: if the total overhang of C1 lateral masses on C2 facet is greater than 6.9 mm the transverse ligament is probably disrupted, requiring rigid immobilization (However, newer studies that consider radiographic magnification argue that a transverse ligament rupture should not be inferred unless the lateral mass displacement is >8.1 mm, rather than 6.9 mm). Atlas fractures may be easily missed due to inadequate imaging of ocipitoatlantoaxial junction. Thus, in suspect cases, at thin CT cuts from C1 through C3 is indicated, because it is the best radiographic study to evaluate atlas fractures and rule out concomitant C2 injury. Open-mouth (odontoid) view: Classically there is bilateral, lateral offset of C1 on C2. Lateral view: May show prevertebral soft tissue swelling anterior to C1, pre-dentate space (distance between the anterior tubercle of C1 and the dens) may be widened to greater than 3 mm if there is damage to the transverse ligament. CT Scan: Reveals the fractures, their locations and degree of displacement of fragments. MRI: Sensitive at detecting injury to transverse ligament. Although the patient neurologically intact, a Jefferson fracture may be unstable. Those patients are at grave risk for neurologic compromise if not promptly diagnosed and appropriately stabilized and treated. Treatment aims to achieve the spinal stabilization to protect the patient from further nerve damage, including that to the brain stem. The specific treatment should be based on analysis of the mechanism and extent of the injury. Conservative or surgical treatments are available. The principal treatment is with a halo and vest or cast, which remains an effective current treatment for many of these fractures. The treatment selection depends largely on the degree of offset of C1 on C2, whether there is damage to the transverse ligament, and associated cervical injuries. Fracture of the Atlas may occur in isolation or in combination with C2 (Axis) fracture. Nearly 1/3 of Atlas fractures are associated with a fracture of C2. 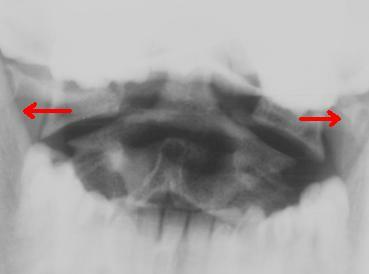 Fractures of the ring of C1 may be associated with an odontoid fracture; thus, the combination of the two fractures should be considered. Furthermore, congenital anomalies of the arch (eg, agenesis of the posterior ring) may be present. Anterior subluxation of C1 on C2 may be present and, if so, often indicates a disruption of the transverse ligament. Even in the absence of a C1 fracture, assessment of stability must include the associated structures. An atlantooccipital dislocation or disruption and C1-2 instability, particularly that in which the transverse ligament may be disrupted, poses severe risk to the brain stem and upper spinal cord. Furthermore, with a C1 fracture, associations exist with unstable injuries such as odontoid fractures and other injuries to the upper cervical spine. In addition, the odontoid fragment may migrate into the foramen magnum, endangering the brain stem and upper spinal cord. Children may represent less unstable cases, presumably because of periosteal stability, and they are often treated with a collar. The body of C1 is not visible radiographically until age 1 year. In a younger patient with limited displacement of the C1, immobilization with a collar or halo and vest may be adequate. In more severe cases, particularly with associated injuries such as odontoid fracture, bypassing the C1 ring with an occipital-to-cervical fusion extending to C2 or lower may be necessary. Instrumentation spanning that area may stabilize the C1 ring, which cannot be otherwise easily addressed directly, because both the anterior and posterior components of the ring are disconnected by the fracture and not amenable to instrumentation or direct repair. Isolated C1 Fractures: Generally do not require surgical stabilization. Fractures displaced greater than 7 mm should be immobilized in a halo device, those with less than 7mm require either a rigid collar or halo, and non-displaced fractures may be treated with a soft or rigid collar. Some injuries may require initial traction. Cases with bony avulsion of transverse ligament (Type II) also can be treated with halo. Severely fragmented fractures with transverse ligament rupture necessiate surgical stabilization [midsubstance rupture of transverse ligament (Type I) with widely displaced (>7 mm) lateral masses]. Combination C1-C2 Fractures: Associated C2 injuries include hangman’s or dens (Type II or III) fractures. Treatment usually depends on type of C2 fracture; Type II odontoid with greater than 6mm displacement must be ruled out because this alone requires surgical fusion. Others may be treated with halo or SOMI brace. Atlantoaxial rotatory subluxation presents with torticollis, flattened face, and decreased ROM. It occurs spontaneaously or following minor or major trauma; rheumatoid arthritis patients are at increased risk. CT shows rotation of the atlas on the axis. Acute subluxation may be treated with traction but if present for greater than 3 months should receive halo fixation. Surgical C1-C2 fusion may be necessary in cases of recurrent or longstanding subluxation. Jefferson G. Fracture of atlas vertebrae: report of four cases and a review of those previously recorded. Br J Surg 1920; 7:407–422.